Let me tell you about my game. 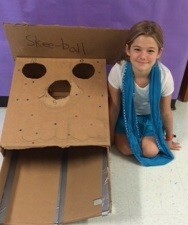 To play Skee-ball you will get 5 balls and you try to earn as many points as you can within your 5 turns. The points: middle hole is worth 5 points and the two top holes are worth 10 points. Pay $2.00 for a fun pass ( unlimited time of play),or four cans of non-perishable items. All proceeds will benefit the Children's Hospital Dallas and Manna Food Drive.